Dice the tomato and onion and mix in a small bowl. Chop cilantro and chile; add to the tomato and onion mixture. Squeeze the juice of half a lime over the mixture and sprinkle with a pinch of kosher salt. Stir to mix well. Yields 2 servings (a total of about 1/2 cup of salsa). If you don’t eat it all immediately, it will keep in the refrigerator in an airtight container for up to 2 days. 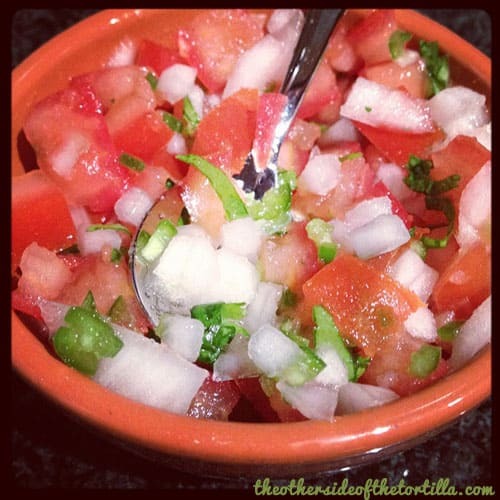 How do you make your salsa mexicana? What’s your favorite thing to put it on? I would throw there chunks of avocado too! Great post!